The second day of the 2018 World Rowing Indoor Championships started with the para-rowing events. Athletes had travelled from around the world to compete in these races. All six events went off at the same time with all athletes lined up in the same block of machines. The biggest entry was in the men’s PR3 category with six competitors. It was a tight race between Sean Gaffney from Great Britain and Milan Lackovic from Slovakia. In the last meters, Lackovic managed to pull ahead and take the gold medal in a time of 6:32.2 – a very fast time for the 2000m race. Robert Niesyczynski from Poland came through in third place. Only two competitors entered in the women’s PR3 category. Patricia Walsh (USA) finished first in a time of 7:57.4. Walsh competed in triathlon at the 2016 Paralympic Games in Rio, but suffered an injury to her knee. As part of her rehabilitation, Walsh started indoor rowing and she hasn’t looked back. “Today, my coach and I had a really good race plan. This is my first competition, so I was kind of distracted and all over the place. I am hoping to train for Tokyo 2020 and figure out where my opportunities are to compete. This is my first year having the opportunity to compete it the sport, so I am open to whatever comes my way,” said Walsh. It was another gold for the United States in the women’s PR1 event when Hallie Smith finished in a time of 9:18.5. “Once I get in a race, especially a coxed race like this, my brain just kind of goes blank and I just tell myself, keep the rating down. I often get anxious and go with a really high rating, which doesn’t give me as good of speed,” Smith said after the race. Smith is hoping to make the on-water national team this summer and go in search of a medal at the World Rowing Championships. “I really want to medal in Bulgaria. That would be a dream come true. A lot of the women I will probably compete against, like Moran Samuel is a big hero of mine and Birgit is amazing. To be able to medal against some of these great rowers would be amazing,” Smith said. The men’s PR1 event saw Zsolt Peto from Hungary take home the gold. Peto got into his rhythm right from the start and managed to hold it. His finishing time of 8:17.6 was more than 30 seconds ahead of second-place finisher Jaroslaw Kailing from Poland. Shannon Franks from the USA took the bronze medal. In the men’s PR2 event, four competitors were vying for medals. Poland’s Michal Gadowski set the fastest pace and could not be stopped. He finished in a time of 7:24.4. The international field saw Spain’s Jorge Pineda come through in second with a time of 8:15.7 and in third place, Kenneth Mars from the USA. “Today’s was my best time and I am very pleased with that. I could not have done better today. Rowing is my dream, I love it. It is amazing to be active in sport every day,” said Gadowski. Simultaneous para-rowing races of 1000 metres were run through the local Erg Sprints competition. Results from the entire competition can be found here. This article first appeared on www.worldrowing.com. 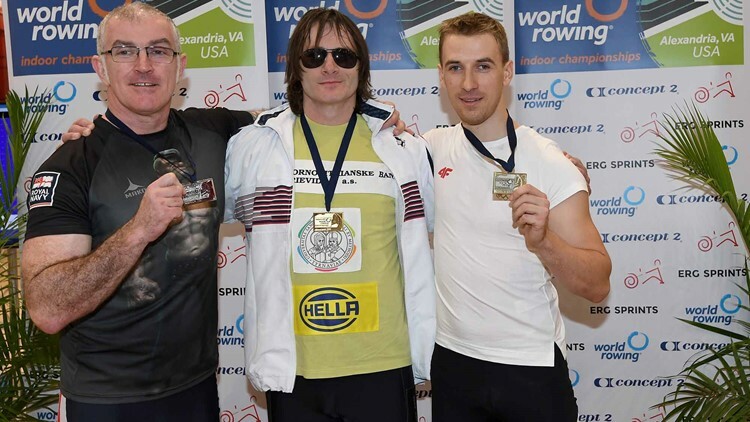 Thank you to World Rowing, an Erg Sprints | WRIC event sponsor.